As many of you know, I love how the name of something can lead to expectations - while not always the truth. In this case, there is a huge caveat. There is NO cream in this soup. There is no dairy in this soup. Yes, it's creamy, but the depth comes from a secret ingredient: instant potatoes! If you must have some cream in your creamy soup, feel free to add a small dollop or sour cream on top, just before serving. Trim the woody ends off the asparagus. Cut the stalks into 1 inch pieces, leaving about 2 inches of the tip intact. Bring a small pan of water to a boil. Boil the asparagus tips for 1 to 2 minutes, then drain and set aside. Heat a stock pot over medium heat. Add the olive oil, along with the onion and garlic, and cut up pieces of the asparagus stalks. Cook for 2 or 3 minutes. 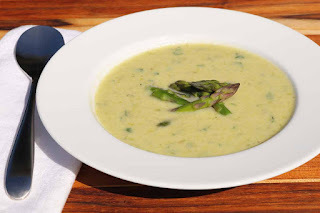 Add the white wine and continue to cook for another minute, until the onion begins to turn translucent, and the asparagus turns a deep green color. Add the broth, along with the thyme, and cook until the asparagus is tender, about 15 more minutes. Transfer the soup to a blender and blend on medium for about 1 minute, until just mixed, but not until smooth. Return the soup to the soup pot, heating the stove to low heat. Add the mashed potatoes, creamer, and parsley. Stir until blended and warm. Don't let the soup come to a boil, as the creamer may begin to separate. Taste for seasoning, and correct by adding sea salt and black pepper as needed. To serve, ladle a bowl with soup, adding some of the asparagus tips as a garnish. 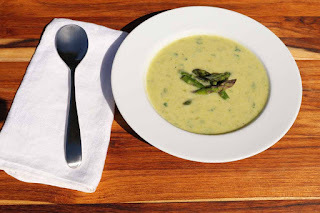 If using the sour cream, add one dollop of about 2 tablespoons to the top of the soup bowl, adding the asparagus tips as the top garnish. Stealthy Cooking Tip: When blending hot liquids, remove the small portion of the blender top. Cover the opening with a towel and blend. This will keep the hot liquid from spattering your kitchen or burning your hands.